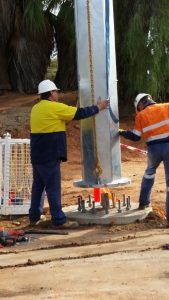 Datacall Telemetry Pty Ltd, and its subsidiaries RDG Electrical and Sunraysia Engineering Consulting (SECONS), are proudly owned and operated in Mildura, North West of Victoria, situated on the borders of New South Wales and South Australia. In 2012 Datacall Telemetry was acquired by Sam Primarano and Robert Gulbin. This added the telem etry and product solution based business to its growing electrical engineering consulting and contracting business portfolio. Datacall Telemetry now employs 14 staff members consisting of engineers, technicians, industrial electricians, sales and administrative staff. As an independent Electrical Engineering, Radio Telemetry and System Integration Company within the region, we are positioned to offer the best solution for our clients. We ensure the latter by developing technical expertise in all facets of our business and encouraging a diverse experience of platforms, technology and industries. Datacall can provide onsite support as required in a short response time. Our office is staffed during business hours with 24 hour on-call support available. We also offer additional support flexibility for more remote business locations with remote support options that can be tailored to suit our client’s needs. Datacall Telemetry has developed a reputation for excellence in our technical appreciation and solution development through our continuous investment in people, well developed methodologies, system integration and, most importantly, through working closely with clients to align our solutions to their desired outcomes.